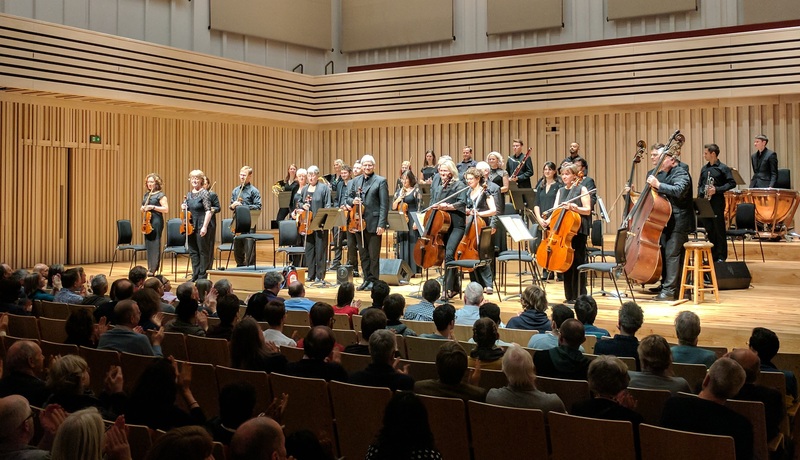 The Northern Chamber Orchestra (NCO) works in close collaboration with Manchester Metropolitan University’s Faculty of Education taking creative music initiatives into North West primary schools across Manchester and Cheshire. Stanley’s Stick: NCO Music & storytelling (illustration by Neal Layton from the book, ‘Stanley’s Stick’, by John Hegley). Recently this partnership has delivered inspiring musical storytelling sessions, based on John Hegley’s book Stanley’s Stick and a teacher-training workshop inspired by NCO’s musical story, the Bear Hunt, demonstrating how NCO musical sessions can support cross-curricular activity, such as music and art with literature. The NCO also provided a violin, double bass and percussion trio for the World Picnic Day at the University’s Birley campus. As part of Manchester Met’s innovative STEAM initiative (incorporating Art and Design and Music into Science, Technology, Engineering and Mathematics education), the NCO is developing projects that connect with STEM objectives, such as junk percussion workshops, exploring the science of sound. Manchester Metropolitan University has been training teachers, practitioners and professionals for over 100 years and is instrumental in educating the region’s workforce. The Faculty of Education has a partnership with over 1,300 schools, colleges and organisations covering a wide geographical area and diversity of social, economic and cultural backgrounds. Each year nearly 3,000 undergraduates and postgraduates study full-time with us on over 70 Education-related courses, including PGCE Music and Specialist Instrumental Teaching. Our award-winning Brooks building (where NCO is also based) has specialist facilities, including a drama studio and performance space, music technology suite and practice rooms. Many of the Faculty’s teaching staff are actively involved in research and our Education and Social Research Institute is an internationally recognised centre of excellence for applied research and evaluation with interests spanning early childhood, socio-technical changes, communication and social justice. We have specialist centres of expertise in STEM Education; Inclusive Education and Disability Studies, Childhood, Youth and Community and Educational Leadership Management. Our worldwide links extend across Europe, Nigeria, China and the USA. Supporting inclusion, educational aspirations and community engagement are central to the Faculty’s ethos and we are delighted to continue our partnership with the Northern Chamber Orchestra.